Day three of their fishing holiday saw Jamie and Dan back at Bungsamran Lake in Bangkok fishing for Mekong Catfish and Giant Siamese Carp in Thailand. Fishing from a private bungalow with four rods saw the anglers catching a succession of hungry Striped and Mekong Catfish with weights ranging between 8-25kg’s. The anglers varied their approach and fished with both floats and bottom fishing methods with both techniques producing fish after fish. 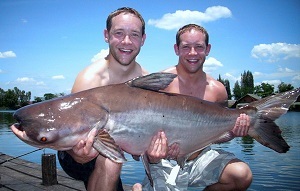 Both Jamie and Dan caught several large Mekong Catfish which tested them to their limit physically. After a short break for lunch the anglers continued hauling and banked further Mekong Catfish and Striped Catfish. Jamie and Dan failed to get in contact with any Giant Siamese Carp but were rewarded with a bonus Rohu of an estimated 9-10lb’s. At the end of their days angling the UK duo had succeeded in banking a double figure haul with both anglers catching in the excess of ten fish each with fish to an estimated 30kg’s.